AMMONNEWS - There is no income tax law, even at the global level, that could be acceptable by all members of the societies, said Prime Minster Omar Razzaz. "It is not required to categorically uphold the bill by citizens, whom we speak to in full transparency and honesty that the taxation threshold would not affect the overwhelming majority of them", Razzaz told a meeting at the Interior Ministry on Thursday. What we want, he said, that all segments of the society and citizens to familiarize themselves with the much-awaited legislation and understand the law before prejudice it. He said the draft bill amending the income tax law focuses on the realization of principles of justice, fairness and social solidarity. The new law, he added, would not add taxation burden on the poor and low-income people. He, moreover, warned of discourse dominated by the very few affected category by the draft bill. 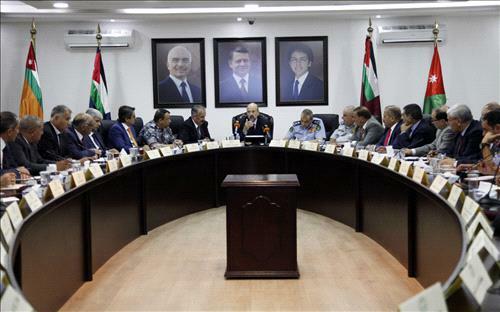 Everyone has the right to speak his mind, but it should not insult others or our firmly held national principles, Razzaz told the meeting attended by the Interior Minister, governors and chiefs of security apparatuses. On economic reform, the premier said the Kingdom is capable of carrying out reforms as long as it is strong, however, genuine reforms could not be achieved if the country went vulnerable. Also, the prime minister listened to a briefing by the chiefs of security services and governors on their plans to upgrade the services provided to citizens.